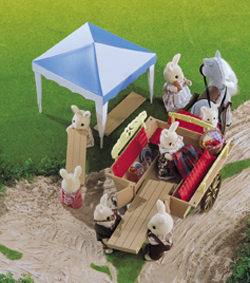 The Pony & Trap includes a Marquee & Picnic Set so that all the Sylvanians can enjoy a trip out in the countryside on the Trap and then have a great picnic with all their Sylvanian friends. 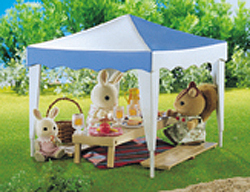 The Marquee transforms into a canopy for the Trap and the picnic table and accessories can be stored away neatly inside the Trap. 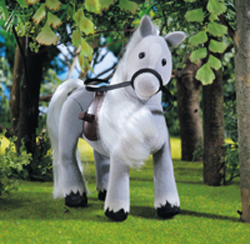 Set includes: Ivy the Pony, freewheeling trap, marquee, picnic table, two picnic benches, bucket, brush, comb, harness, picnic hamper & rug, napkins, plates, jug and over 15 scrumptious picnic goodies! Ivy just loves pulling the Trap, racing along as fast as she can go because she's always in a hurry. Some of the Sylvanians tell her to slow down as going so fast is very scary but she knows that secretly a lot of them find it very exciting!